Here are those five texts, followed by a few observations and conclusions. 18 Then Jesus came to them and said, “All authority in heaven and earth has been handed over to me. 19 Go therefore and make disciples of all nations, baptizing them in the name of the Father and of the Son and of the Holy Spirit, 20 teaching them to observe all that I have commanded you. And behold, I am with you always, to the end of the age. 15 And he said to them, “Go into all the world and proclaim the gospel to the whole creation. 16 Whoever believes and is baptized will be saved, but whoever does not believe will be condemned. 17 And these signs will accompany those who believe: in my name they will cast out demons; they will speak in new tongues; 18 they will pick up serpents with their hands; and if they drink any deadly poison, it will not hurt them; they will lay their hands on the sick, and they will recover. 8 But you will receive power when the Holy Spirit has come upon you, and you will be my witnesses in Jerusalem and in all Judea and Samaria, and to the end of the earth. the promise of the abiding presence of Jesus would be available to all of them for the purpose of fulfilling the task until all the work was done (e.g., “the end of the age”). promised that powerful signs would accompany the proclamation of the good news (i.e., casting out demons, spiritual language, supernatural protection, and the administration of healing through prayer and the laying-on of hands). do these things in the power of the Holy Spirit. were to be primarily occupied with helping people process the issues related to forgiveness of (i.e., release from or retaining of) sins. be his witnesses – ultimately to the far-reaches of the planet. Theirs would be a global impact. The whole world would be touched. This is very different from present habitual pursuit of really good attractional church services on Sunday mornings, and well-organized programs, classes, and seminars during the week in clean, modern, well-furnished facilities, which use the latest-greatest equipment and technology. Much of what is thought of as ministry today is better categorized as institutional advancement facilitated by both managing and suppressing the fickle appetites of come-and-go-consumers, in the power of human ingenuity. We are in danger of telling ourselves that we are indeed alive (or believing it because we’ve built such a reputation) simply because we are busy, complex, and “state-of-the-art” (see Rev. 3:1). I share that last part because the first Christians did not have our “ministry delivery system” and they grew by millions and millions of people in a matter of decades. 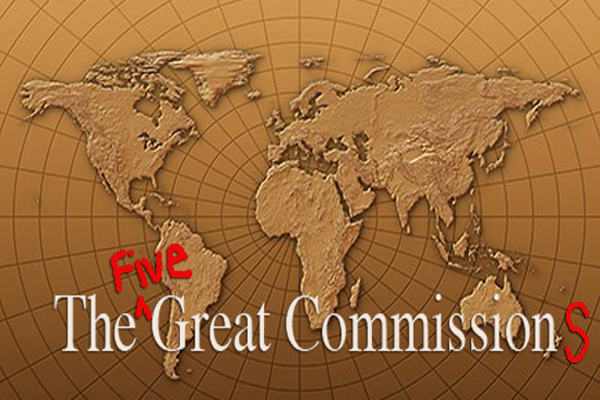 They had (and they lived) the (five) Great Commission(s) in organic, every-day, intentional ways. These five texts tell us our focus, our activity, and our mission no matter who we are or where we live. The Great Commission is utterly non-dependent on so many of the things we have come to see as essential to the work of the Church of Jesus. In fact, I am in a place in my own life where I am convinced that doing without many of those things will allow me to finally do what these texts envision without all the clutter, baggage, and diversion of resources away from the mission of God and His people. As an exit question, what would your “church life” look like if you decided to live out the imperatives and values of these five texts, and to do nothing else? How radical would that be? What would you do differently? What would change? Let me know if you’d like in and I’ll get you an invite. – As He is GOING He uses an Attractional Benevolence Model which is healing, feeding, casting out demons, teaching, and loving people (Act 10.38). – Secondly, as He is GOING, He uses the Synagogue Model. He goes where religious people hang out and finds the spiritually hungry (Mat 9.35). – And as He is GOING, He uses the Person of Peace (or House of Peace) Model. Basically entering into a village and finding a person that wants to hear about the King and His kingdom (Lk 10.5-9). Assignment: Look at the Gospel of Luke and give examples of how Jesus used these three models to enter into a culture of lostness. Robby – Please invite me to that group. Awesome! Kenny, very thought provoking. I have copied it so that I can use it next semester when we discuss soteriology and eschatology/Kingdom of God. But first, I have to meditate more on it myself. Edifying and very cool. “And all things are of God,Who Hath Reconciled us To Himself By JESUS CHRIST, and Hath Given To us the ministry of reconciliation; to wit, that God Was In CHRIST, Reconciling the world unto Himself, not imputing their trespasses unto them; and Hath Committed unto us The Word Of Reconciliation! Now then we are ambassadors for CHRIST, as though God Did Beseech you by us: we pray you in CHRIST’s Stead, be ye reconciled to God! For HE Hath Made HIM To Be sin For us, WHO Knew no sin; that we might be made the righteousness of God In HIM! We then, as workers together with him, beseech you also that ye receive not The GRACE Of God in vain! May God RICHLY Bless ALL! Scripture seems to insist on loving others as ourselves & maybe that’s a given when church’s teach the great commission. It’s easy to love others who are not part of our lives, but so many Christian’s struggle with loving their own families while they busily have so called ministries. The finger points back at me for not loving the people who I am judging. I googled how many times scripture discusses Great Commission compared to love others like you love yourself. Just sayin’.